Every time I see a small, well meaning company being squashed by a huge one like Facebook, I feel like I get a glimpse of the ugliness behind the dorky, sincere-esque smiles of characters like Mark Zuckerberg and his Silicon Valley ilk. For all the wholesomeness and 'oh how did I get here' awkwardness, they're ruthless, willing to crush anyone and everyone who they perceive to be intruding. 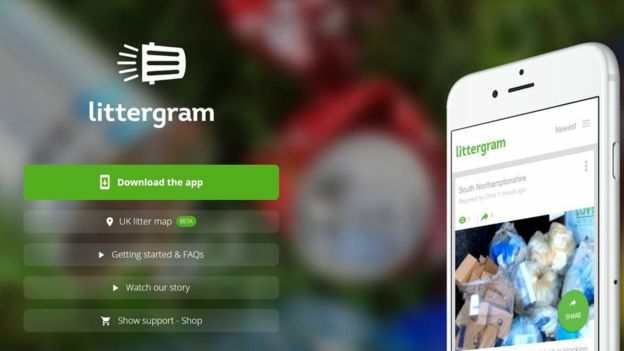 One of Facebook's most recent, most ridiculous targets was LitterGram, a British app set up intended to encourage people to take photos of litter around their local area, which then get shared to the local councils to get on the case. So British, so endearingly, excruciatingly British. It should have been given a name like 'If you wouldn't mind...'. Who the hell could such a thing possibly offend? Facebook, apparently, as back in April they actually threatened LitterGram with legal action unless they changed the name to something less similar to Instagram. LitterGram developer Dan Lucas recorded a direct plea to Zuckerberg to drop the charges, which to date has been viewed 5,000 times. Until now, it had seemed like the plea had fallen on deaf ears, or at least uncaring ears, but on Wednesday the news trickled through amidst the Trump slurry that Facebook had quietly dropped the suit. LitterGram received a letter from Facebook stating that "Based on your letter and what you have said to us previously, we understand LitterGram is only being used for a non-profit public service anti-litter campaign". Lucas funded the app by himself, and at time of writing it boasts 20,000 active users. It's no Instagram, but it's far nobler in cause, and in a strange twist of irony, this defunct lawsuit has probably provided some halfway decent publicity in one sense or another. Facebook were complimentary about the app in the letter, and Lucas likewise praised them for dropping the case. Of course, it never should have been a thing in the first place, but corporate bullying aside, it all had a happy ending. It'd be nice to think that this was Zuckerberg's plan all along, his own weird way to encourage a firmer environmental conscience in the UK, but somehow I doubt that.